Monday May 2 1910 It was a rainy day. I took care of my chickens that are beginning to hatch. Did the work and some mending Will down town all the forenoon. 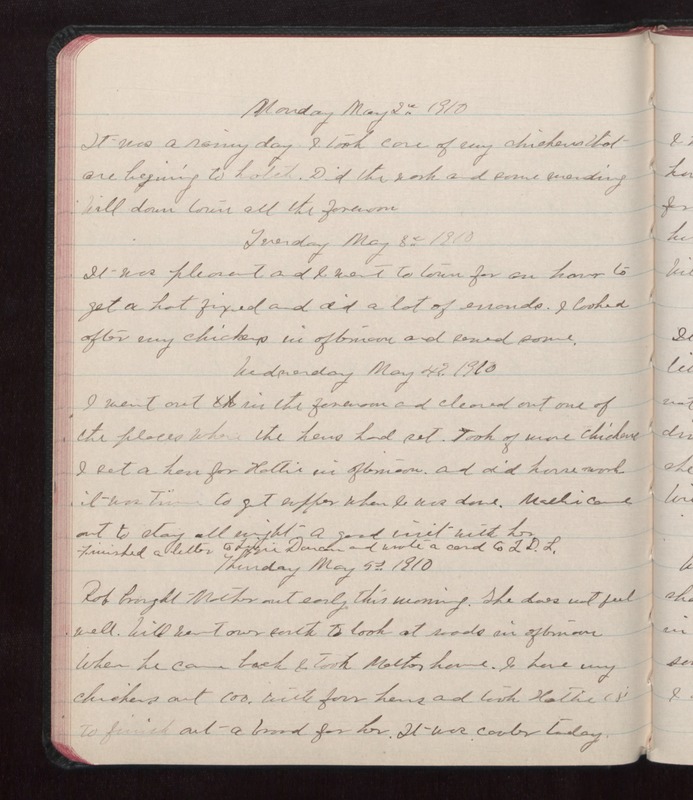 Tuesday May 3 1910 It was pleasant and I went to town for an hour to get a hat fixed and did a lot of errands. I looked after my chickens in afternoon and sewed some. Wednesday May 4 1910 I went out in the forenoon and cleared out one of the places where the hens had set. Took of more chickens I set a hen for Hattie in afternoon. and did house work it was time to get supper when I was done. [illegible] came out to stay all night. A good visit with her Finished a better to Lizzie Duncan and wrote a card to L.D.L. Thursday May 5 1910 Rob brought Mother out early this morning. She does not feel well. Will went over south to look at roads in afternoon When he came back I took Mother home. I have my chickens out too, with four hens and took Hattie's to finish out a brood for her. It was cooler today.